A couple who have spent the last 20 years fundraising in memory of their daughter have presented surgeons with yet another show of gratitude this week. Ruth and Tony Knowles, from Sutton-on-Sea in Lincolnshire, have raised more than £161,000 to say thank you for the care shown to 22-year-old Emma Jayne before she died of a rare brain tumour in 1998. 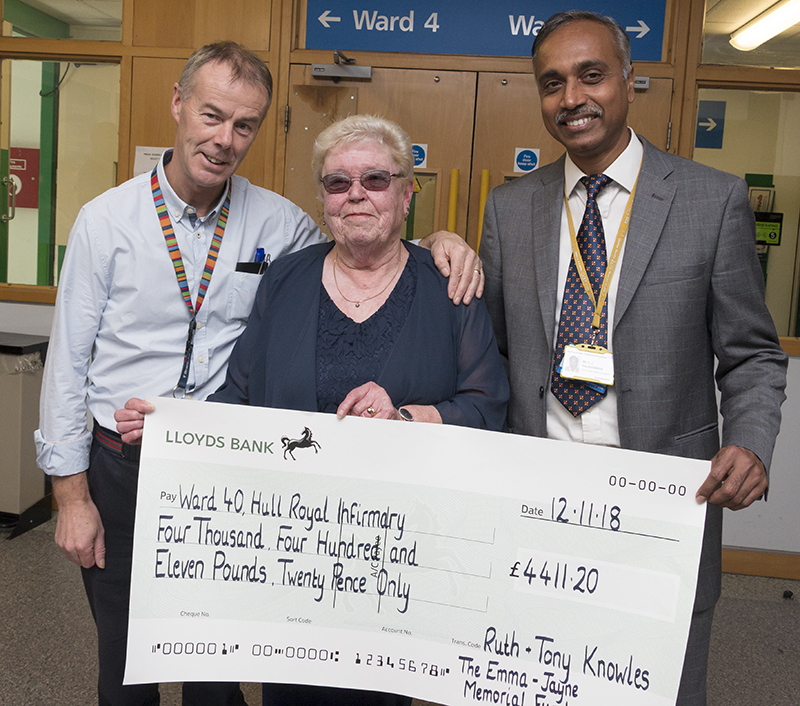 The couple visited the neurosurgical team on Ward 40 at Hull Royal Infirmary earlier today to hand over their latest cheque from the Emma Jayne Memorial Fund. The cheque for £4,411,20 comprised sponsorship raised through the annual bikeathon, 10K run and 4 ½ mile walk which the Knowles organise every year in Little Cawthorpe, near Louth, plus proceeds from their yearly charity evening. In total, Ruth and Tony, who were each awarded the British Empire Medal in the 2014 New Year’s Honours for their fundraising endeavours, have raised £161,063.49. This has been used to purchase specialist equipment and to support the ongoing care and treatment of neurosurgical patients at Hull Royal Infirmary. The couple began fundraising for the trust after Emma-Jayne died of her inoperable brain tumour in 1998. Emma-Jayne was working as a post woman for the Royal Mail when she started experiencing double vision and cold hands. She went to her GP and an MRI scan revealed she had a brain tumour. She was admitted to Hull Royal Infirmary in April 1998 under the care of consultant Kevin Morris and was found to have a rare brain tumour affecting just one in 1.5m people. With the tumour too deep in Emma-Jayne’s brain for surgeons to operate, she received 35 radiotherapy sessions but died in December 1998, six days before Christmas and two weeks before her 23rd birthday. Her parents asked for donations instead of flowers at Emma-Jayne’s funeral and raised £1,100, donating half to the GP surgery and half to Hull Royal Infirmary’s neurosurgical team. When they attended Hull Royal Infirmary to hand over their first cheque, Mr Morris told them he was attempting to raise £12,000 for a spinal turning bed. Determined to achieve something good in their daughter’s memory, the couple embarked on a fundraising challenge, raising the money for the bed through a series of charitable events including a bikeathon which has continued every year since. They decided to keep on raising money for the hospital and, 20 years after the loss of Emma Jayne, they have raised enough money to pay for dozens of pieces of vital equipment. Ruth says: “The staff on Ward 40 are amazing. “We are trying to help patients who will never know us by purchasing what are known as luxury items. Neurosurgeon, Mr Chittoor Rajaraman, says: “Ruth and Tony have raised a phenomenal amount of money for us over the last 20 years and we’re very grateful for all they have done. “It gives all the staff such a morale boost when we see them and see just how much effort they have put into supporting our patients and our work over such a long period of time. Ruth is pictured above with Consultant Neurosurgeons Gerry o’Reilly (left) and Chittoor Rajaraman.